A famed criminologist, paralyzed from the neck down, Rhyme compensates for his physical disability with his brains -- and the arms and legs of his brilliant and beautiful protégé, Amelia Sachs. 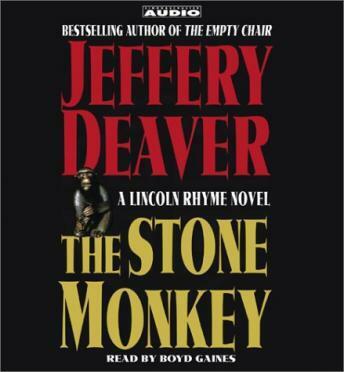 The awe-inspiring duo returns in The Stone Monkey. Recruited to help the FBI and the Immigration and Naturalization Service perform the nearly impossible, Lincoln and Amelia track down a cargo ship headed for New York city carrying two dozen illegal chinese immigrants, as well as the notorious human smuggler and killer known as 'the Ghost.' But when the Ghost's capture goes disastrously wrong, Lincoln and Amelia find themselves in a race against time. They must stop him before he can track down and murder the two surviving families who have escaped from the ship and vanished deep into the labyrinthine world of New York City's chinatown. Over the next harrowing forty-eight hours, the Ghost ruthlessly hunts for the families, while Rhyme struggles to find them before they die. Amelia pursues a very different kind of police work -- forming a connection with one of the immigrants that may have consequences going to the core of her relationship with her partner and lover, Lincoln Rhyme. Typically I do not like abridged books, but the reduced length did not seem to impact the story too much. There were only a few "how did they jump to that conclusion: moments. A Lincoln Rymes book. I like this series alot. It has a twist at the end that you do not expect. Not up to par with Bone Collector, but still a very good read. typical but well written mystery. reader was good.